There’s lots of advice out there on how to build a strong and smoothly functioning nonprofit Board of Directors. Dr. Richard LeBlanc, York University law professor, had public companies in mind when he recently published 40 proposals to improve board governance. Many of his suggestions I find extremely relevant to NFP boards and their longstanding challenges. Here are some of my adaptations of his proposals. 1. Reduce the size of the board. Decision-making needs to be reasonably facilitated. Large boards promote “free riding” and inhibit decision-making at board meetings. 2. Limit director over-boarding. Some volunteers may serve on a half dozen boards. When recruiting candidates with such credentials, the nomination committee should know ahead of time the types of contributions the person is able to make. 3. 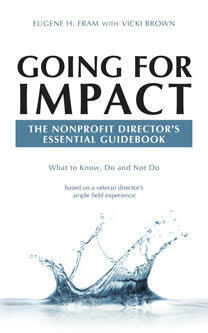 Increase the directors’ knowledge of the nonprofit’s field(s) of operations. As much as possible, have directors become more familiar with the field in which the organization’s mission resides, become aware of its challenges, conduct robust assessments of outcomes, not processes, and assure that policy compliance is taking place. 4. Enable directors to have access to information and to managers reporting to the CEO. The 21st century requires transparency, and directors, on occasion, should be able to interact with personnel below the senior management levels. e.g. key financial personnel , directors of new programs. The governing board should have a procedure of facilitating these interactions, especially related to how the information developed needs to flow to other directors and the CEO in a confidential manner. 5. Select directors who can contribute directly to the organization’s mission. While each nonprofit hopes that every director is passionate about the organization’s mission, it is important to remember that other directors, who simply support the mission, can make substantial contributions in many ways. 6. Hold management accountable. Annual assessments of the CEO and organizations need to be robust. Where either quantitative or qualitative objectives (http://bit.ly/OvF4ri) fall short of expectations, management needs to provide a plan for corrective actions, along with designations of who will be responsible for improvements. 7. Control management’s influence on director selection. NFP CEOs need to be involved with suggesting and meeting potential director candidates. However, the board needs to be sure that the whole process of director selection is not delegated to management, as sometimes occurs with nonprofit organizations. 8. Address conflicts of interest fully. First be alert to all instances where a director, manager, staff person or volunteer can be perceived as acting in his/her self-interest or benefit. A procedure needs to be established in the bylaws allowing for a special board committee, independent adviser or counsel to address these issues when they occur. 9. Match management’s compensation with contributions to achieving mission, corporate performance and risk management. In making assessments in these areas, management must agree that goals are reasonable, the CEO has participated in establishing rules for judging outcomes and that there is a reasonable level of trust between the board and management. 10. Stay on message when communicating organizational outcomes. Regularly send reports to all stakeholders about mission accomplishments and gaps, and the reasons for the gaps. Value transparency. 11. Understand the difficulty, if not the impossibility, of replacing elected directors. Most NFP directors are volunteers and formally unseating one or more will lead to conflict. Even when the bylaws offer such a procedure, any conflicts emanating from implementing it will likely have significant negative outcomes for the organization. According to Professor LeBlanc, “ The Board Chair and other Directors shall be attuned to (promptly addressing)… vulnerabilities or opportunities to achieve the organization’s (mission). This includes the following vulnerabilities : incapable or incompetent management; … empire building; … waste; fraud; poor operating and financial performance; inefficient deployment or management of capital assets;… a complacent board or board culture; and legacy directors who skills do not (currently) support. the mission.” In terms of opportunities, they need to be reviewed by board-staff committees and moved to the board with reasonable alacrity. Source: Richard LeBlanc (2013) “Forty Proposals to Strengthen the Public Company Board of Director’s Role in Value Creation; Management Accountability to the Board; and Board Accountability to Shareholders.” Boards and Advisors, York University. ← Fundraising Foundations: Important Nonprofit Tools for the 21st Century? Thanks for your comments and insights. I agree with your analysis which was translated at follows. Réduire le conseil d’administration: Un conseil d’administration flexible, souple et efficace n’est pas trop nombreux. Limit the number of board members: To be flexible and efficient a board should not have too many members. Permettre et faciliter le lien entre les administrateurs et les gestionnaires sous la direction générale: en cette ère de transparence, faciliter les communications et l’échange d’information entre les administrateurs et les gestionnaires qui se rapportent à la direction générale. Enable and facilitate the link between the administrators and managers who report to senior management : in this age of transparency, it’s very important to facilitate communication and the exchange of information between and among the administrators and managers who report to senior management . Valoriser la transparence: j’ai d’ailleurs écrit un article au sujet de la transparence. Enhance transparency : I actually wrote an article on this subject. Prévoir un processus d’évaluation du conseil d’administration, par ses membres, sa direction générale et peut-être des gestionnaires principaux ou employés s’il y a lieu, afin d’identifier les lacunes et améliorer son fonctionnement, son efficacité, et le plaisir de ses membres à s’y impliquer. Provide an evaluation process of and for the Board, by the members of the Board, by general management and, where appropriate, by senior managers or employees, to identify gaps and improve the Board’s performance and efficiency, and the willingness of its members to get involved. Train administrators : they are likely not to know the rules of operation, not to have read the bylaws and likely not to know their rights and responsibilities, wanting to interfere in operational matters rather than focus on the strategic vision. In short, offer general training, but also offer tailor-made courses that identify the specific needs of the organization and the expectations of the Board.